Charles Woodson has been chasing an interception of Peyton Manning his entire career. Sunday marks perhaps his last chance. 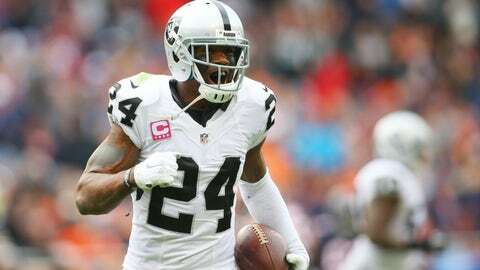 Oakland Raiders safety Charles Woodson has recorded 62 interceptions during his long NFL career, but the 39-year-old safety is hoping to snag his first pick of Peyton Manning. In an interview on NFL Network, the veteran admitted he’d love to make a play on one of Manning’s passes. Denver is a 4.5-point favorite, according to Odds Shark, so the Oakland’s defense is the potential difference-maker in the AFC West clash. Woodson has already managed two interceptions in 2015, so he’s at least trending in the right direction. Plus, Manning has floated more than a few passes this season. If Woodson is in the proper spot on a misthrown deep shot, he’ll probably tally that much-wanted first interception. Woodson, who entered the league in 1998—the same year as Peyton—is running out of opportunities to intercept the Hall of Fame quarterback. If the Raiders safety doesn’t get to Manning on Sunday, Woodson’s final chance might be during what could be a snowy outing on Dec. 13. Go get that pick, Woodson.